ALBANY – Rosamunde “Rose” Spadaro, 90, of Albany, passed away peacefully on Thursday, January 19, 2017 at the Kingsway Arms Nursing Center in Schenectady. Rose was born in Albany, she was the daughter of the late William Strobel and Babette Nothling Strobel. She lived in Albany most of her life. She was a graduate of Albany High School and one of the first women from the Albany Area to serve in the U.S. Air Force. She was employed at a local bank, by the Albany Country Club, and for many years served as a lunch mother at Holy Cross Grade School. She loved spending time with her family and her late husband at their Adirondack camp. They would go fishing and spend time outdoors. 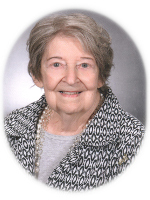 Rose was a lifelong Communicant of Saint Margaret Mary’s Catholic Church (now All Saints Catholic Church) and was a member of the Rosary Altar Society. She loved to cook and to feed everyone. No one went hungry in her home. Rose had a wonderful sense of humor right until her last days. German was Rose’s first language. In 2001 she honed her skills and traveled to Germany to discover her roots and communicate proficiently with her relatives. She was also a fan of the NY Yankees and the NY Giants, JFK, Frank Sinatra, Christopher Plummer, Russell Crowe and Derek Jeter. Many who knew her considered her to be the salt of the earth. Rose is predeceased by her husband Charles N. Spadaro, and by her daughter Susan Cummings Furlong. She is survived by her children Nancy C. Cummings Dupra (Gary), of Penn Yan NY, Rosemary Spadaro Vatalaro (Jim), of Daniel Island, SC, and Christine Spadaro Durkee (Ken) of Clifton Park; her son in law Kevin Furlong of Albany; her grandchildren Jonathan Dupra (Kim), Joseph Furlong, Michael Furlong, Aidan Vatalaro, Anna Vatalaro, Madison Durkee, and Ryan Durkee; her great grandchildren Garrett and Bode Dupra; and by several nieces, nephews and cousins in the US and Germany. She is predeceased by her sisters Charlotte “Luddy” Bartholomew, and Wilma LaChapelle. The family would like to thank Rose’s nieces, nephews, and members of the Bartholomew family for the wonderful care and help they gave to Rose. The family would also like to thank the staff of Kingsway Arms and Community Hospice for their superb care and love they showed Rose in her final weeks. Funeral services will be held in the Hans Funeral Home, 1088 Western Ave., Albany, Saturday morning at 8:15 a.m., and from there to All Saints Catholic Church, 16 Homestead St., Albany (behind CVS) at 9:00 a.m. Relatives and friends are invited, and may call at the funeral home Friday from 4-7 p.m. Interment will be in St. Agnes Cemetery, Menands. The family suggests memorial contributions to the Building Fund at St. Clare of Assisi Church, 1947 Central Ave, Albany, NY 12205. To leave a message of condolence for the family or obtain directions to the funeral home, please visit www.HansFuneralHome.com . To the Spadaro family, I am an out of town friend of Christine. My condolences go out to your family. After getting to know Christine I know you all have a deep love for your Mom. I will be praying for her and your family. I’m so sorry for your loss of your mom she will always be missed. Her sense of humor was unique! And her advice on things in life in general I loved sitting and sharing stories about way back when we were all kids growing up and talking about cooking she loved my food when ever I would make something i thought she would enjoy I’d call her and ask do you want to try it? She’d say oh yeah! She was the only aunt i ever really got close to I love her with all my heart and I will miss her till we meet again! RIP Aunt Rosie! ! Christine, please accept my condolences on the passing of your mommy. I did not have the honor of meeting her, but I am certain you inherited her beautiful giving heart, nurturing nature, sense or humor. I pray that God will grand you the strength you need to get through this. Stay strong . I will keep you and your family in my thoughts and prayers. I’m so sorry to hear about “Rose” passing my condolences to the family my prayers to you all. My short time taking care of Rose was truly a pleasure. She was a trooper. I miss our great talks and the stories she would tell me and surprising her with pizza. Thank you for sharing such a Gem. There are not enough words to describe the loss of your dear mother. I can only say how deeply sorry I am for your loss. From the moment I met her I knew and I think she did too, that we would become more than client and caregiver. I had the privilege of caring for her and for that I thank you all. In the almost 5 years I was with her I had the utmost love, respect, admiration and adoration for her, but most of all, which she once said to me was by far more important, I genuinely liked her. She gave me laughter, friendship, a nick name I cherish and that stick!! !so much more I will keep with me always. How she loved you all and was SO proud of all of you. How does one say good-bye, we don’t, we hold her in our hearts until we meet again. Our most sincere condolences to the family on the passing of such a lovely lady. We are so sorry for your loss of your mother Rose. May care and love of those around you provide comfort and peace to get you through the days ahead. Christopher and my most sincere condolences.